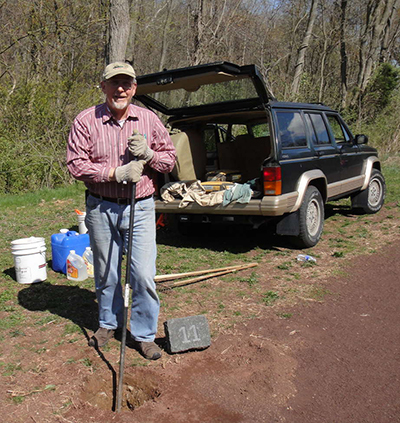 Peter Sperry installs black granite mile markers along the Canal towpath. The Mile Marker chart lists Delaware Canal Milestones, with information about donors, dedications, locations, and status. The placement of these markers was made possible through generous donations in response to a drive conducted by the Friends. The three pilot installations – markers #15, 29 and 46 – were made in 2004. These initial markers were carved from gray argillite supplied and cut gratis by Architectural Stone Division of the H&K Group of Douglassville. As they deteriorated more quickly than anticipated, the three pilot markers were replaced by black granite blocks. All subsequent markers are black granite. 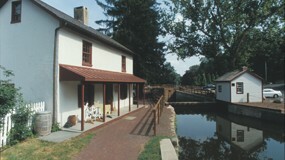 Their placement is in accord with the 1964 Canal Survey, per the Delaware Canal Landmark and Mileage Chart. 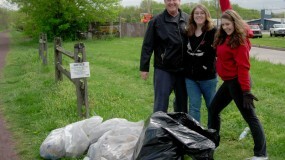 Peter Sperry, author of the Landmark and Mileage Chart, prepared the markers for installation, and he and his volunteer crew placed them in the ground. In nearly every case, the mile markers can be found on the east edge of the towpath trail. You can download this Mile Marker chart in PDF form.